EU exit: death of the WTO option? The one good thing about the Ukip manifesto - about which we remarked yesterday – is that it accepted that Article 50 negotiations are the preferred option for arranging our exit from the EU. And in calling for a free trade agreement affording us access to the Single Market, the party also appears to be turning its face against the WTO (or "free-for-all") option. Despite the manifest problems with other aspects of the Ukip manifesto, these two developments are significant, and especially the apparent rejection of the WTO option - the idea that we do not need to negotiate any trade agreements with the EU and can go it alone, under the umbrella of WTO rules. This alone is a major relief, as the enthusiasm for it in some quarters threatens to destabilise the case for EU withdrawal. One of the converts to this idea is Ruth Lea. She was formerly an advocate of the so-called "Swiss option" (page 27), so she now stands – without explanation - completely at odds with her earlier position. But we have also seen an intervention from Global Britain. This organisation wrongly believes that major nations such as the USA, India, China, Japan and Australia have no trade agreements with the EU, on which basis it argues that the UK should be free to trade under existing international law using WTO rules. Like Ruth Lea, they believe that when we leave, we do not need to negotiate a trade agreement with the EU. Their case is built on arguments that, as we will see shortly, are fundamentally flawed – resting on an incomplete understanding of how the international trading system works. Thus, although Ukip have stood back from this option, it is still necessary to give it a decent burial. Lea herself argues that fifty percent of international trade is conducted under WTO rules, without Regional Trade Agreements (RTAs). On that basis, she asserts, this is "not some dreadful, minimum, minority option". But even there, she is wrong. For a start, all trade between WTO members - whether within the ambit of trade agreements or not - is carried out "under WTO rules". Where she particularly misstates the situation, though, is that the RTA is by no means the only form of trade agreement. A significant volume of trade between developed and less-developed countries is carried out via a different form of agreement, known as preferential trade agreements (PTAs). Nearly 20 years ago, in 1997, these amounted to around 42 percent of trade. Although they have dropped to around 15 percent, that still means that the majority of world trade is conducted under the aegis of bilateral trade agreements. Interestingly, though, much of the trade liberalisation comes not via bilateral agreements but unilateral tariff reduction. These account for roughly 66 percent of the decline in average tariffs in developing countries during the last two decades. Some 25 percent has come out of the Uruguay Round and only around ten percent has been gained through RTAs. The gradual decline in tariffs has mean that they are now much less an important barrier to trade than they used to be. This is something which Ruth Lea and Global Britain concede. – as does the Democracy Movement in its latest pamphlet. It is this decline which they use to legitimise their argument that we do not need to negotiate a free trade agreement with the EU, as the classic form of this agreement is directed towards tariff reduction. This, though, ignores the changes in the way countries have sought to protect their positions, in the absence of tariff wall. As tariffs have diminished in importance, they been replaced by so-called Non-Tariff Measures (NTMs) or Technical Barriers to Trade (TBTs). These have become far more important than tariffs and are of far more concern to advanced trading countries such as the USA, India, China, Japan and Australia. Furthermore, they are a growing scourge. In 1995, the WTO received 386 formal notifications of TBTs. By 2013, they had risen to 2,137. Overall, TBTs are estimated to add more than 20 percent to the costs of international trade, against a trade-weighted average of 2.6 percent for goods from third countries sold into the EU Single Market. Here, on of the most important TBTs are regulatory measures produced by individual nation and by blocs such as the EU. Exporting countries selling manufactured goods to the EU have the particular problem in that they can only place their products on the market when they meet all the applicable requirements and standards required by the EU. Those standards, rather than tariffs, have become the main barriers to trade. In many countries, this is partially resolved either by all parties adopting common international standards, by exporting countries adopting EU standards as their own, or by agreeing equivalence between similar national standards. This is one of the crucial issues which puts to bed any idea that leaving the EU is going to lead to a bonfire of regulations that the WTO advocates so adore. The world is rushing to achieve regulatory convergence - regulation is now being carried out on a global scale, as a means of reducing trade barriers. However, this is only part of the problem and, as developed countries have achieved a great deal of regulatory convergence. In many respects, it has become the least of the problems. The most troublesome problem that has emerged is not conformity with regulations (and standards), per se, but the need to verify conformity, through what is called the conformity assessment procedure. It is here that things can get very complicated and expensive. Unless conformity is verified by an approved body before goods reach the Single Market, they can be required to undergo testing and document checks at the border. Not only can this cause considerable delay, it can lead to the rejection of perfectly sound produce, bringing trade to a halt. To avoid this happening, exporting countries do two things. First of all they set up their own conformity assessment systems, ones which match the systems in the EU and are at least equivalent to them. Then they seek their recognition of their systems from the EU. And here is the essential point: recognition is done through a special type of trade agreement known as the Mutual Recognition Agreements (MRA). These enable conformity to be checked and approved before the goods are despatched, so that the goods are able to enter the Single Market without further checks. Australia, Canada, Japan, New Zealand, the USA, Israel and Switzerland all have MRAs with the EU. China also formalised an agreement on customs cooperation on 16 May 2014. This, and other agreements on customs co-operation, considerably eases the flow of trade. Furthermore, China also tends to resort to the Memorandum of Understanding system, as in here, here and here. These do not have the status of full-blown treaties but, with a Communist government, have binding effect in their society. And, while each MoU might deal with narrow issues, collectively they add up to a substantial area of co-operation. We saw, for instance, the EU-China Cooperation Plan in Agriculture and Rural Development, agreed "under the auspices of the annual bilateral Agricultural Dialogue to enhance cooperation in the fields of sustainable agricultural production, organic agriculture, rural development and agricultural research". This paved the way for the free trade in organic produce between the EU and China. All such agreements are essential to trade, and they do not represent "free trade" on the model promoted by the WTO advocates. Even without formal RTAs, the trade is highly regulated and controlled by processes that, in themselves, facilitate the flow of goods. The regulations and the agreements are not the barriers - they help remove the barriers. The important thing to understand, though, is that such agreement have far more value to the trade between the different nations than the marginal advantages gained by reducing the already residual tariffs. But they are not lodged with the WTO as tariff reductions and thus do not register as free trade agreements. 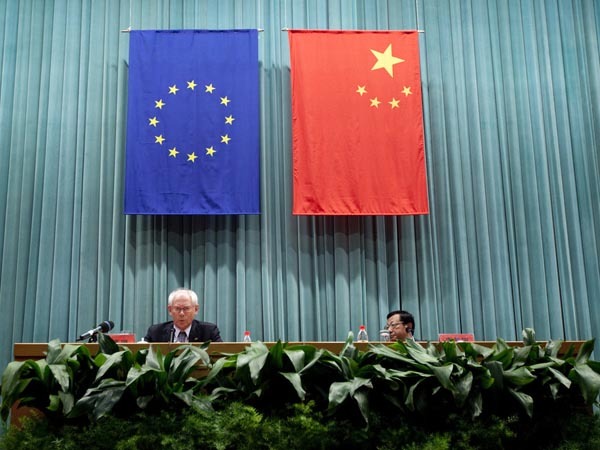 Only because of this can the likes of Ruth Lea can claim that the EU does not have a trade agreement with China. But in fact, it has multiple agreements - 65 over term, including 13 bilateral agreements, ranging from trade and economic co-operation to customs co-operation. None of these are of the simple, tariff reduction variety. Additionally, China tends to tends to foster multilateral relations, working actively through G20, where it agreed with the EU the 2020 Strategic Agenda for Cooperation. Reinforced by 60 high level and senior officials dialogues on topics including industrial policy, education, customs, social affairs, nuclear energy and consumer protection, this makes for powerful relationships which do not show up on the WTO books. As to the UK, should we leave the EU, we will be looking to trade under similar conditions to those enjoyed by Australia, Canada, Japan, New Zealand, the USA, Israel or Switzerland – and China. The only problem is that, if we choose to rely solely on the WTO option, we will be out in the world without covering MRAs and other complex fabric of agreements that serve to lubricate trade. To trade with the EU, therefore, we are going to have to negotiate such agreements - trade agreements by any other name – and, for the time being, tap into the EU's ongoing arrangements. The "no negotiation" stance on withdrawal is not tenable. The WTO option, and what is termed by Global Britain as the "free trade option", is a dangerous fantasy. And at least Ukip has recognised that. The rest need to follow.